Award winner Ab Ream and volunteer Bill Hits bag shell using the Oyster Master device. On September 22nd, the Delaware Center for the Inland Bays (CIB) presented three “Friend of the Bays” awards to local volunteer, Ab Ream, Gary’s Dewey Beach Grill, and the Town of Dewey Beach for excellence in volunteering, business support, and partnership aiding Delaware’s three Inland Bays. Ab Ream was presented with the Friend of the Bays Volunteer Award for his work developing the “Oyster Master”, a system the CIB uses to bag recycled oyster shell efficiently. 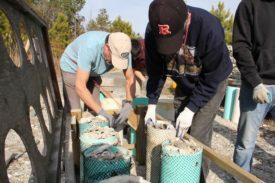 Since implementing this device last year, the CIB has been able produce over 2,000 oyster bags that can be used to stabilize living shorelines and provide a solid base for created oyster reefs. Gary’s Dewey Beach Grill was the 2017 recipient of the “Friend of the Bays” Business award. For several years, Gary’s has been a generous partner of the CIB. Gary Cannon and Holly Ski accept the Outstanding Business Award for Gary’s Dewey Beach Grill. and restore the Inland Bays through their 2015, 2016, and 2017 Gary’s Dewey Beach Brewfest events. In addition, the restaurant’s co-owner and namesake, Gary Cannon, serves on the CIB’s Citizen’s Advisory Committee which brings Bay-related issues of public concern to the CIB Board of Directors. The Town of Dewey Beach was presented the 2017 “Friend of the Bays” Partner award for their excellence in implementing the Inland Bays Comprehensive Conservation and Management Plan over the years. 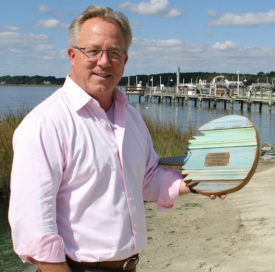 Dewey Beach Mayor, TJ Redefer, poses with the Town’s Friend of the Bays award on the shore of Rehoboth Bay. The Town has provided excellent representation to the Center’s Board of Directors and has been a consistent supporter of the Center’s Decked Out summer fundraiser. Most recently, the Town partnered with the CIB to develop a long-term plan to retrofit stormwater controls to reduce flooding in Dewey Beach and improve water quality in the Inland Bays. The 2013 Friend of the Bays awards were presented at the annual Thanks-for Giving barbecue on Saturday, September 28 at the James Farm Ecological Preserve. Ron Kernehan was presented with the Friend of the Bays Volunteer Award for his work developing and leading the Inland Bays Inshore Fish Survey. He and his team of citizen scientist volunteers have counted and recorded data on 126,277 fish since beginning the surveys in 2011. 57 fish species have been identified by 114 volunteers who have logged over a thousand hours pulling seines and recording data that is adding to the knowledge of marine life in the Bays. The Banks of Banks Wine and Spirits in Millville approached the Center several years ago with the idea to partner on a fundraiser to raise money for the Inland Bays and the result was the very successful Bays, Bubbly and Brushstrokes, a unique event that celebrated the start of summer on the Inland Bays. Since then the Banks’ have helped the Center in a variety of ways; donating to and sponsoring events like the Thanks-for-Giving Barbecue and Decked Out, and serving on a committee to plan fundraising and friend-raising events for the Bays. For their on-going support, they were awarded the 2013 Friend of the Bays Business Award. South Bethany Mayor Kathy Jankowski, and former Mayors George Junkin and Gary Jayne accepted the 2013 Friend of the Bays Partnership Award for the Town of South Bethany. 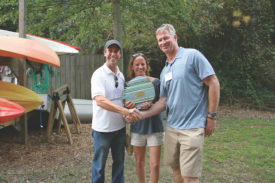 The Town of South Bethany was honored with the 2013 Friend of the Bays Partner Award for their long and productive partnership with the CIB in support of cleaner Inland Bays. A series of proactive mayors, council people, and resident volunteers have grown the town into a true leader for clean water. South Bethany worked with the CIB to plan and implement an innovative stormwater retrofit project, initiated community outreach and education to improve water quality in their canals, and has many volunteers who monitor water quality in the canals and the Bay. CIB Executive Director, Chris Bason (left) presented the 2013 Friend of the Bays Director’s Award to Speaker of the House, Pete Schwarzkopf, receiving it on behalf of the members of the 147th General Assembly of the Delaware State Legislature for their passage of House Bill 160 in June, which will allow for shellfish aquaculture in the Inland Bays. The 2013 Friend of the Bays Director’s Award was given to the members of the 147th General Assembly of the Delaware State Legislature for their passage of House Bill 160 in June, which will allow for shellfish aquaculture in the Inland Bays. In addition to the Friend of the Bays Awards, special recognition was given to volunteers who have worked with the CIB at the James Farm Ecological Preserve on Cedar Neck Road in Ocean View. Owned by Sussex County and managed by the Delaware Center for the Inland Bays, the Farm is a 150 acre oasis of fields, forests, marsh and sandy beach on Indian River Bay with trails and observation platforms. Special recognition was given at the Thanks-for-Giving event to volunteers who have worked with the CIB at the James Farm Ecological Preserve on Cedar Neck Road in Ocean View. Two volunteers, Greg Thompson and Carly Collins were honored for their contributions. Two volunteers, Greg Thompson and Carly Collins were honored for their contributions. Greg for his work in helping to keep the James Farm looking its best and assisting on building and repairs to boardwalks and platforms where know-how and carpentry skills are needed. Carly was recognized for ‘growing up’ with the CIB, volunteering at the Native Plant Sale and other events, and starting a Nature Club for teens at the Bethany Beach Nature Center which maintains a bluebird trail at James Farm, assists with trail cleanup, and conducts monthly water testing at their wetland at the Nature Center. Recipient: Graham Purchase. Awarded posthumously for his many years of involvement as a Citizens’ Advisory Committee member, Scientific & Technical Advisory Committee member, CWMP participant, and overall great watershed steward. Graham brought passion, a keen mind, and a scientist’s disposition to his work on behalf of the Center for the Inland Bays. 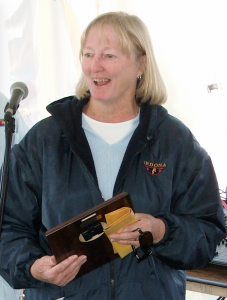 The award was kindly accepted by his wife, Nancy. Recipient: Delaware Division of Parks and Recreation accepted by Ken Farrell, Park Administrator of DSSP and Gary King, Manager of the Indian River Inlet Marina in DSSP.